After reading the very favorable reviews of Napa Acoustic's MT-34 Integrated Tube Amplifier and NA-208c CD Player by Home Theater Review managing editor Andrew Robinson, I became aware of this company's existence for the first time. When I went to its website, I saw that it also imports a speaker brand called Mistral. When I contacted Joseph Kwong, the owner/designer of Napa Acoustic, he recommended that I review the reference Bow-A2 floor-standing model, which retails for $2,299 per pair. By reading Andrew's two reviews of the Napa Acoustic pieces, I was expecting a tremendous bang for the buck ratio. 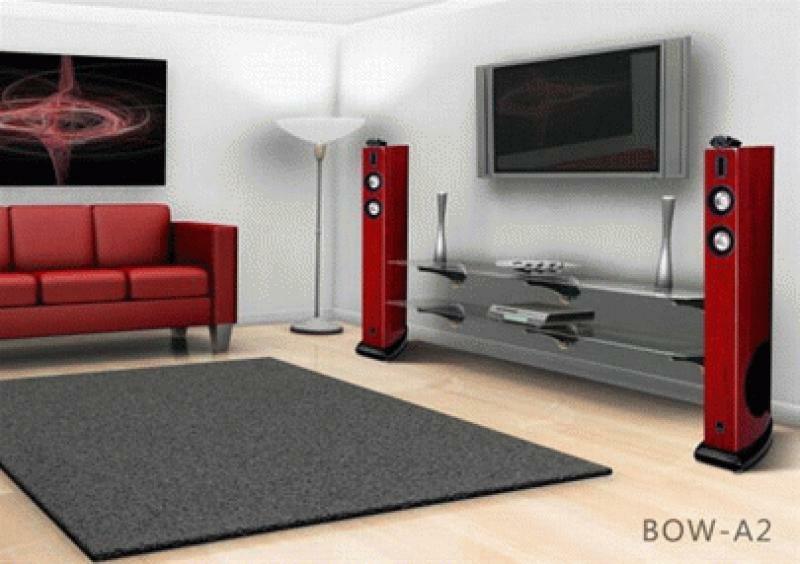 As you will see, the Bow-A2 speaker turned out to be one of the greatest surprises I have had in my reviewing experience since I became a member of the staff here at HomeTheaterRerview.com. • Explore subwoofer pairing options in our Subwoofer Review section. • Find amplifiers in our Amplifier Review section. To my surprise, as I unpacked the Bow-A2 speakers, I was completely stunned, not only by their visual beauty, but also by their build quality. The Bow-A2 speakers were covered in a high-gloss rosewood veneer, with an attached black lacquer pedestal. The Bow-A2 measures 47 inches tall by a little over seven inches wide and 15 inches deep. Each speaker weighs 60 pounds and is rated from 30Hz to 45KHz. The stated sensitivity is 89 dB, with a minimum of 6 ohms. It also uses very high-grade drivers, scored from well-known European companies. The Bow-A2 has a three-way ported design that uses two aluminum four-inch midrange drivers, a three-quarter-inch ribbon tweeter and a side-mounted ten-inch subwoofer. Sitting on top of the Bow-A2, mounted in its own pod, is a one-inch super tweeter. Additionally, each speaker has a pair of high-quality posts for bi-wiring and two small ports to vent the midrange drivers. The final placement of the Bow-A2s in my listening room for optimum performance was three-and-a-half feet off of the front wall, six feet apart with a very slight toe-in, and three feet off of the side walls. The first musical selection that I used to hear what the Bow-A2 could offer was "Soul Eyes" (STUCD Records) by the group Smokers Lounge. Smokers Lounge is a jazz combo that plays with the Danish National Chamber Orchestra. I was immediately entranced by the beauty of the timbres and the melodic tonality of both the horns and the stringed sections of the orchestra. The Bow-A2 renders a reference-level tonality that offers all the micro-details in the music without ever sounding less than warm and natural. However, if you're a micro-detail connoisseur who demands to hear every element that a recording has in it, you will absolutely admire and be captivated by what this speaker has to offer. Auditioning the Bow-A2 to determine how it responded to explosive dynamics at high pressure levels, I began the process by listening to "The Qudrat" (Ensemble Records) by Lasse Thoresen, who used real percussion instruments and synthesizers. At the highest sound levels, reaching well over 95dB, the Bow-A2 was producing taut room-shaking bass with total ease. It gave the wonderful illusion that I was sitting in the large hall where the recording took place. The size, depth and height of the soundstage that the Bow-A2 created on this recording ranked as one of the best I have ever heard, even compared to those provided by my reference Lawrence Audio Cello speakers, which cost $17,000 more. Concluding my auditioning process, I wanted to test what the Bow-A2 would do with an audiophile-quality recording of a small acoustic-based group. The perfect album for this was the Jimmy Cobb Quartet's rendition of "If Ever I Should Leave You" (Chesky Records). On this recording, Cobb's cymbals are airy and just float into the air if the speaker has great high-end extension. Another feature of this great recording is the brassy and warm sound of Roy Hargrove's flugelhorn. The Bow-A2 remarkably showed its great ability to effortlessly create totally natural timbres through the shimmering fine details of Cobb's brush work on his cymbals and the richness and tone of Hargrove's horn. Read about the high points and low points of the Bow-A2 speakers on Page 2.